Hopefully we won’t have as cold of a winter as last year. But if we do, some ideas from this trade catalog might keep you warm! Bear Brand Blue Book of Yarnkraft is full of ideas of things to knit or crochet. It has clothing apparel for both ladies and men. 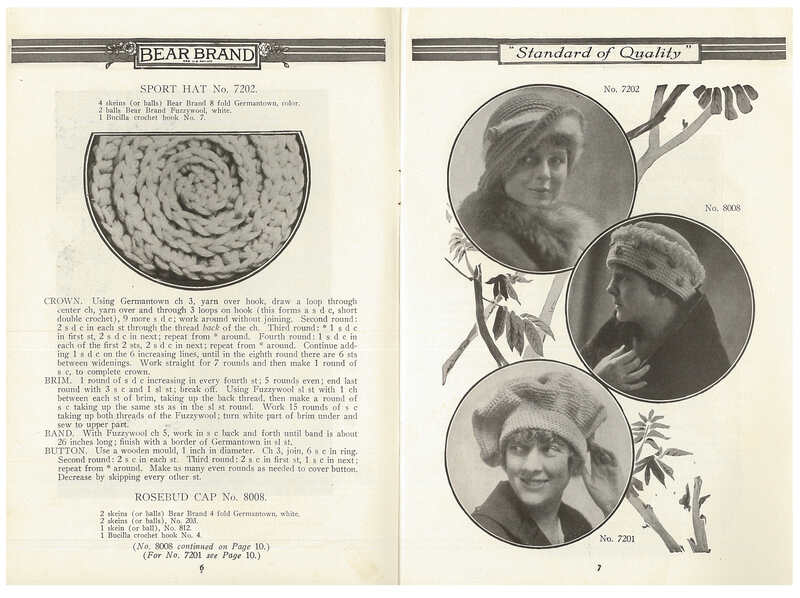 For ten cents in 1917, Bear Brand Blue Book of Yarnkraft, Volume 17, by Bear Brand Yarn Manufacturers, Inc. would have taught you how to knit or crochet something warm. Bear Brand Yarn Manufacturers, Inc., New York, NY. 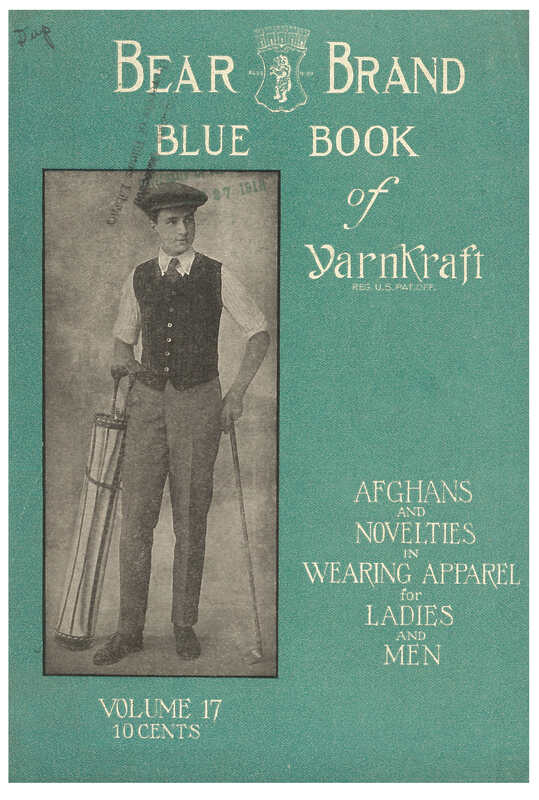 Bear Brand Blue Book of Yarnkraft, Volume 17, 1917, front cover of catalog showing a man with golf clubs wearing a golf vest. 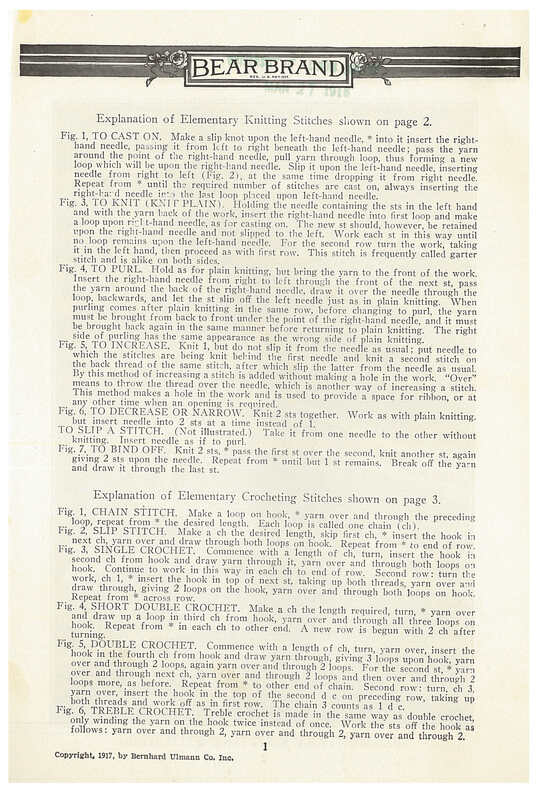 The catalog begins with explanations of elementary knitting and crocheting stitches. Some of the knitting stitches include “to purl” or “to cast on.” The crocheting stitches include the chain stitch and short double crochet. Bear Brand Yarn Manufacturers, Inc., New York, NY. Bear Brand Blue Book of Yarnkraft, Volume 17, 1917, page 1, explanations of elementary knitting and crocheting stitches. Click to enlarge. The next two pages show close-up illustrations of those specific knitting and crocheting stitches. The left page shows the knitting stitches while the right page shows the crocheting stitches. Bear Brand Yarn Manufacturers, Inc., New York, NY. Bear Brand Blue Book of Yarnkraft, Volume 17, 1917, pages 2 and 3, close-up illustrations of elementary knitting stitches (page 2) and elementary crocheting stitches (page 3). Click to enlarge. Then it continues with instructions on how to knit or crochet different items. One item is a blanket, or the Slumber Robe, illustrated below on the right. At the bottom of the left page is more useful information on knitting and crocheting abbreviations and terms. Bear Brand Yarn Manufacturers, Inc., New York, NY. 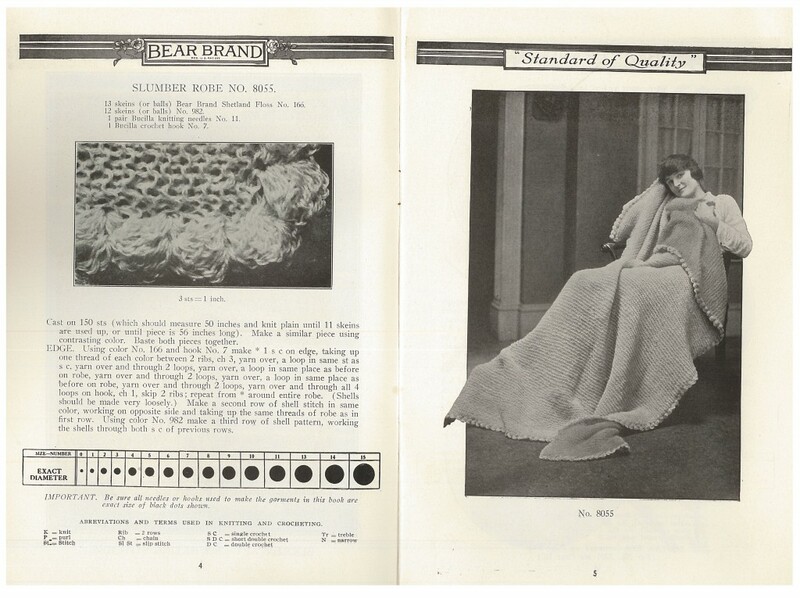 Bear Brand Blue Book of Yarnkraft, Volume 17, 1917, pages 4 and 5, Slumber Robe No. 8055 and “Abbreviations and Terms Used in Knitting and Crocheting.” Click to enlarge. Other items in this catalog include hats, caps, scarves, vests, and slippers. The Sport Hat No. 7202 is shown in the illustration below, on the top right. A button on the side of the hat’s band adds a little decoration to the hat. Bear Brand Yarn Manufacturers, Inc., New York, NY. Bear Brand Blue Book of Yarnkraft, Volume 17, 1917, pages 6 and 7, Sport Hat No. 7202 (with instructions), Rosebud Cap No. 8008, and Golf Tam No. 7201. Click to enlarge. Bear Brand Blue Book of Yarnkraft, Volume 17, is located in the Trade Literature Collection at the National Museum of American History Library. Bear Brand Yarn Manufacturers Inc. 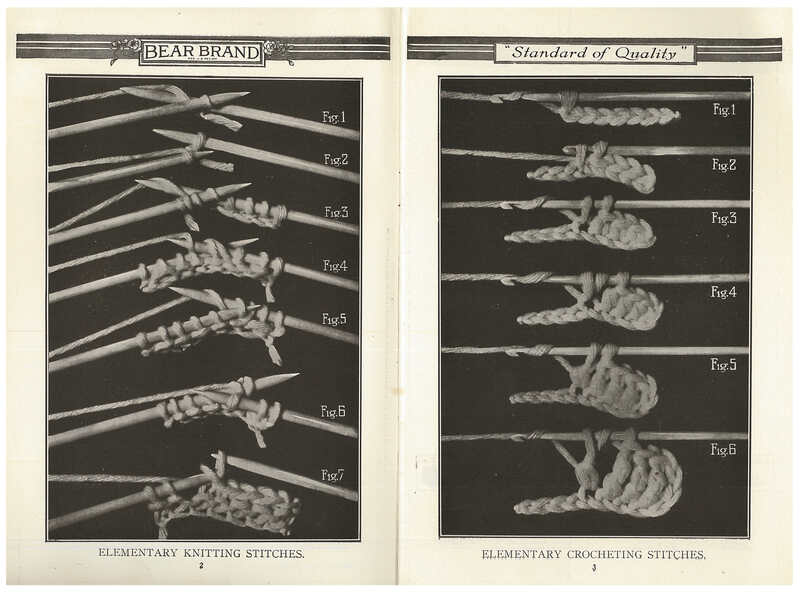 Interesting to see heavily touched up photography used to illustrate how to make the stitches. Today’s publications almost universally use line drawings, which are much easier to make out. Presumably that’s because no one today would think you were behind the times if you used a schematic drawing rather than a photo.